Nancy Pelosi and the radical Open Border Democrats are trying to push through the biggest amnesty and citizenship giveaway ever. H.R. 6 would give amnesty and a pathway to citizenship to 2 million illegal aliens. The goal is to have all of them voting for Democrats as soon as possible. If the Left pushes this through, the Republic as we know it is finished. Republicans are already jumping on board and agreeing to vote for this monstrosity. You CANNOT allow this amnesty giveaway to go through! Please, you have to fight back before it's too late! Send your instant FaxBlast to Congress right now and FORCE them to kill H.R. 6 and stop Leftists from giving citizenship to millions of illegal aliens! If you allow H.R. 6 to pass, your political career is finished. Congress isn't even pretending to talk about "comprehensive" immigration reform anymore-- trading amnesty in exchange for stricter immigration enforcement. 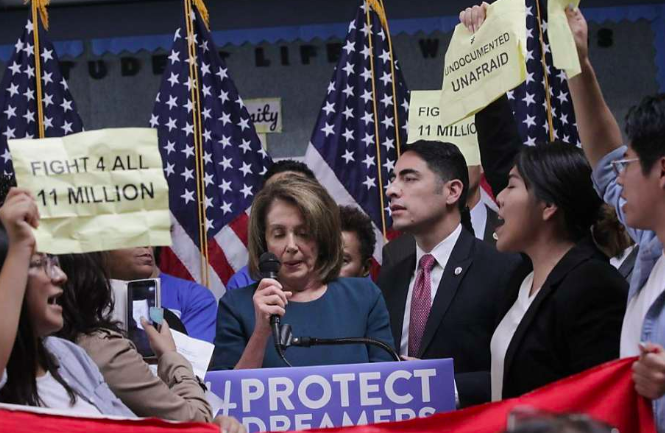 Nancy Pelosi is scheduling a vote on the American Dream and Promise Act, a clean amnesty bill that would legalize and grant citizenship to 2 million illegal aliens and TPS recipients. All without any border security strings attached. You were elected to Congress to represent the American people and the electorate, not illegal aliens. Do you have any idea what passing an amnesty bill like this, while blocking border wall construction, would do to this country? Border Patrol is being forced to abandon its interior checkpoints because there are simply too many illegal aliens streaming across the border. And now you want to pass a bill that will not only dole out amnesty and citizenship, but encourage millions more illegal aliens to come? Yesterday, the House tried and failed to override President Trump's veto over the Border Wall Resolution of Disapproval. Your colleagues want to keep the border as open as possible for when they pass this amnesty giveaway. You need to kill this bill. You CANNOT allow it to pass. You were elected to serve our interests and blanket amnesty is NOT in the national interest. If this goes through, the country will never recover. If you let the bill pass, I promise that you're finished.